622. Chuijun Weng, et al, "Remote Sensor on the FY-1 Satellite", Paper IAF-92-099, 43rd Congress of the International Astronautical Federation, August-September 1992. 623. C. Covault, "Chinese Seek U.S. Assistance in Weather Satellite Program", Aviation Week and Space Technology, 5 August 1985, p. 79-81. 624. Min Gui-rong, "China's Long March Catching Up in Space", Space Technology International, 1992, p. 91-92. 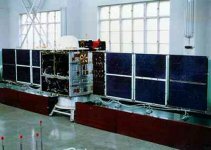 In 1988 and again in 1990 the PRC launched FY-1 (Feng Yun - Wind and Cloud) meteorological satellites into approximately 900-km, 99 degree inclination orbits by CZ-4 boosters from Taiyuan. The spacecraft were designed to be comparable to existing international LEO meteorological and remote sensing systems, including APT transmissions in the 137 MHz band. The satellite structure and support systems were created by the Shanghai Satellite Engineering and Research Center of the China Space Technology Institute, whereas the payload was developed by the Shanghai Technical Physics Institute of the Chinese Academy of Sciences. Both satellites were experimental to test systems prior to the launch of operational Feng Yun 1 spacecraft and were similar in design, although technical characteristics differed. The height of the cubical spacecraft bus (1.4 m by 1.4 m base) of Feng Yun 1A was apparently increased from 1.2 m to nearly 1.8 m for Feng Yun 1B. Likewise, total spacecraft mass increased from 750 kg to about 880 kg. Both satellites were powered by two solar arrays (about 3.5 m long each) with a combined rating of more than 800 W. Nickel-cadmium batteries were used for electrical power storage. Attitude control was maintained by a combination of nitrogen cold gas thrusters and reaction wheels, although both spacecraft suffered serious malfunctions in this system. Feng Yun 1A was lost after only 38 days, but Feng Yun 1B operated for more than a year (References 622-624). 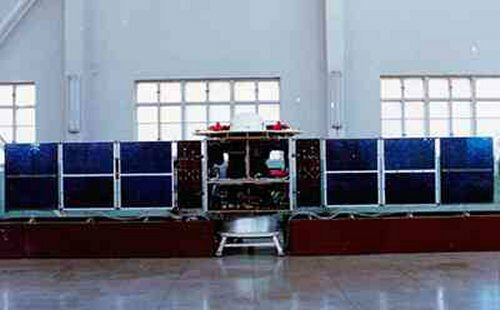 The Feng Yun 1 primary payload consisted of two Very High Resolution Scanning Radiometers (VHRSR) with a combined mass of 95 kg. These optical-mechanical scanners operated at 360 rpm with a 20-cm diameter primary mirror. The five spectral bands used were 0.58-0.68 µm, 0.725-1.1 µm, 0.48-0.53 µm, 0.53-0.58 µm, and 10.5-12.5 µm. The system swath was 2,860 km with a 1.08-km resolution in the High Resolution Picture Transmission (HRPT) mode and 4-km resolution in the Automatic Picture Transmission (APT) mode. China has decided to continue the FY-1 satellite series and to launch FY-1 C, and D. The preliminary schedule time to launch FY-1 C was in the last half of 90's, and the satellites were designed and developed on the basis of FY-1 A and FY-1 B. 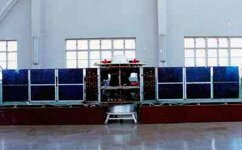 Besides improving the reliability and extending the life of the satellite, Feng Yun 1C and 1D carry a 10-channel scanning radiometer with a resolution equal to that of Feng Yun 1A and 1B, which carried 5-channel scan radiometers. These 10 channels include 4 VIS channels, 3 near IR channels, 1 short wave IR channel and 2 long wave IR channels. The FY-1C and FY-1D satellites are developed on the basis of the FY-1A and FY-1B. 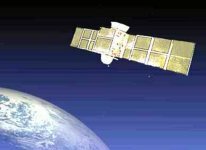 Besides the efforts to improve the reliability of the satellites there are some changes in imaging instruments and data transmission. The channel numbers of the visible and infrared radiometers increased to ten, which improves the observations of the land and oceans. The onboard data storage capacity increased to 300 minutes (60 minutes on the FY-1A/B). China National Satellite Meteorological Center (NSMC) can receive the CHRPT data in Beijing, Guangzhou and Urumqi ground receiving stations in real time. In addition, NSMC can receive global coverage data through four selected channels with reduced resolution (4 km) for one time each day (defined as delayed global picture transmission-DGPT), as well as 20 minutes orbit observation data through ten channels with original resolution at any region of the world (defined as delayed local picture transmission-DLPT). The FY-1C and FY-1D high resolution picture transmission is also very similar to NOAA/HRPT, except the data transmission rate. It is considered that the system which receives and processes NOAA/HRPT data nowadays can receive and process the FY-1 data. The data transmission rate is doubles that of current NOAA/HRPT, i.e., the data transmission is 1.3308 Mbps. The transmission modulation is PSK and bit format is split phase. The design life of FY-1C is two years. 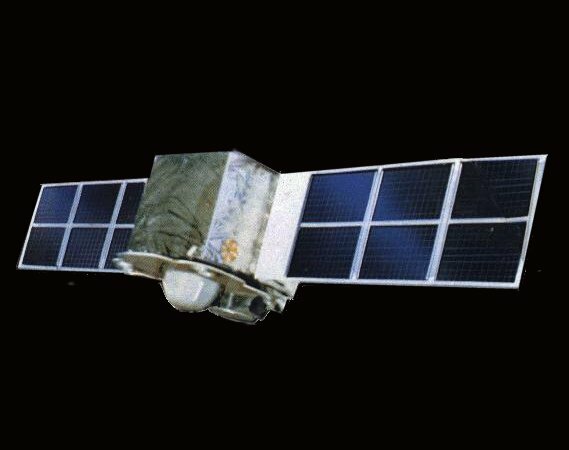 On May 10, 1999, the FY-1C polar orbit meteorological satellite with a ten-channel radiometer as the primary sensing instrument was launched successfully. The FY-1C satellite weighs about 950 kg. The two solar cell arrays mounted on both sides of the main body make the length of the satellite 8.6 meters. The attitude control of the satellite is three-axis stabilized with a precision of no less than 1 degree in all three axes. The FY-1 observation data are disseminated in two modes: high resolution picture transmission (HRPT) and delayed picture transmission (DPT). For HRPT, direct readout services are provided during satellite operations with data format compatible with NOAA satellites. The DPT data are cloud images for selected areas over the world. The ground segment of the FY-1 consists of three ground stations located in Beijing, Guangzhou and Urumqi respectively and Data Processing Center (DPC) in National Satellite Meteorological Center in Beijing. The data received at the ground stations are relayed in real time to the Beijing DPC for processing, distributing, and archiving. 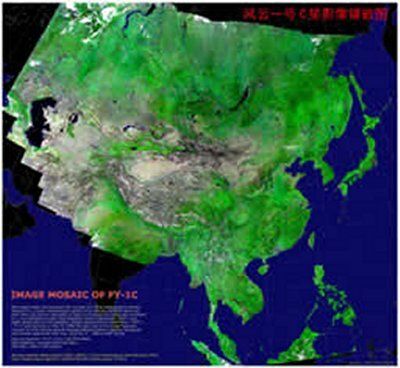 Products from the DPC include cloud image mosaic, meteorological parameters such as sea surface temperature, cloud top temperature and total water vapor, and regional environmental parameters such as vegetation index, snow cover, sea ice, land cover, etc.. All raw data and products are archived on digital tapes.